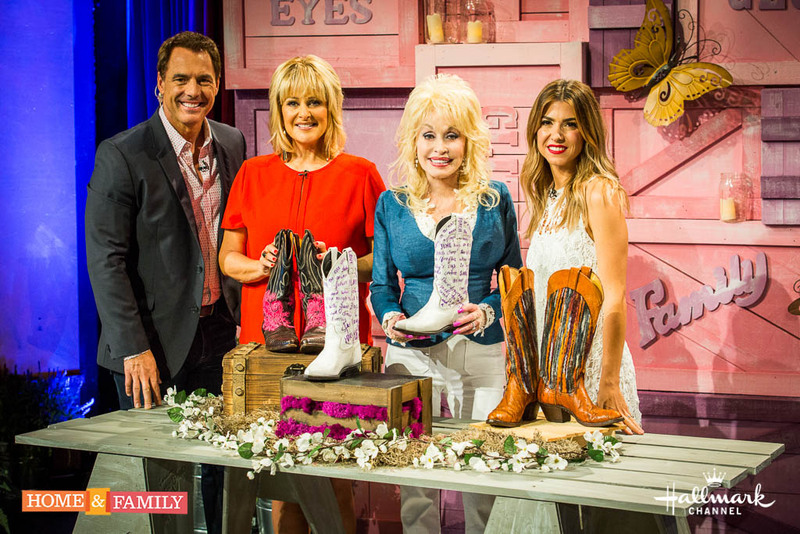 Dolly's week on The Hallmark Channel's Home & Family show from Dollywood that were taped last week begin airing daily at 10 a.m. Eastern Monday (with a repeat airing of each episode at noon the next day). 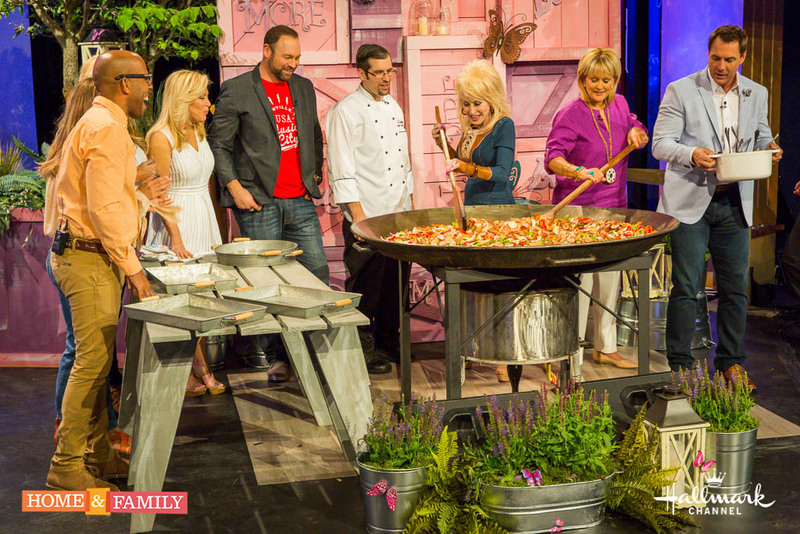 Titled "The Ultimate Dollywood Experience," the week features Dolly and hosts Mark Steines and Cristina Ferrare highlighting the park's charm, rides, shows and cooking as well as live performances by Dolly herself and segments from the show's "family members" lifestyle expert Debbie Matenopoulos, beauty expert Kym Douglas, medical expert Matt Iseman, family man Matt Rogers, fashion designer Orly Shani, DIY expert Ken Wingard and design expert Paige Hemmis. Coverage is available from Dolly's official website here and The Knoxville News-Sentinel here. Publicity photos are available here, here, here, here and here. Happy 50th wedding anniversary to Dolly and her husband Carl Dean! The happy couple, who as it has previously been reported will be renewing their vows today, have seen their special day recognized by ABC News here, The Atlanta Journal-Constitution here, WKRN here and Dolly's official website here. With her Pure & Simple Tour, Dolly continues to talk about the upcoming shows. She spoke with Entertainment Weekly here, noting that the set list will include a segment she is calling "A Piece Of American Pie" featuring songs she will encourage the audience to sing along to including "Blowing In The Wind," "If I Had A Hammer" and "American Pie." She also talked with People magazine about her tour essentials here. I'm told she also has interviews in the June issue of Oprah's O Magazine and AAA of Southern California's Westways magazine, which has an online version available here but you have to enter a Southern California zip code into their website to access it. Thanks, Greg! Awards watching blog Gold Derby notes that the NBC "For Your Consideration" packets have gone out to Emmy voters seeking nominations, and Dolly Parton's Coat Of Many Colors is the only made-for-television movie included in the network's pitch for this year. Read more here. Emmylou Harris' Original Album Series, Volume 1 (with two Dolly covers, one track with Dolly harmony and one track with Trio harmony by Dolly and Linda Ronstadt) rises five to No. 15 on this week's U.K. country compilation albums tally, it was revealed Friday, while Ronstadt's own Original Album Series (featuring one Dolly cover and one track with Dolly harmony) re-enters the top 20 of the same chart at No. 14. Although the ride has yet to officially open, Dollywood on Monday began giving guests the opportunity to ride the new Lightning Rod roller coaster, the world's fastest wooden coaster and first launched wooden coaster. The rides were technically part of the final stages of testing as part of the ride commissioning process. Guests wanting the opportunity had to obtain a guest ticket at the ride and wait in line to ride. The park's website noted "The Lightning Rod roller coaster is now in technical ride rehearsal. The ride may be subject to temporary closure or delays from time to time." The ride was scheduled to open on March 19 but extended ride commissioning to deal with unexpected issues due to the first-time use of new technology delayed the opening. The actual date for official opening, after which it would be expected to operate daily with no closures, has yet to be announced. You may have read it reported here two weeks ago (based on the Facebook postings of the recording studio she visited at the time) that Dolly had recorded a guest spot as the animated character "Noleen" on the Nick Jr. series Lily's Driftwood Bay. The show on Tuesday officially announced the appearance, noting she plays a singing chicken whose yacht gets grounded on the island during a storm and in a two-part episode she tries to convince Salty the sea dog to go on tour with her. In a press release, she noted: "I've never played a chicken before but I have been known to lay a few eggs! Noleen is a very famous chicken, probably one of the most famous chickens ever there was. She washes up on Driftwood Bay and she's trying to get Salty to go with her on tour. Now whether he does or whether he doesn't, you'll just have to watch and see!" The show's producer, Colin Williams, added he wanted a guest star who would appeal to all three generations of the show's fans: kids, parents and grandparents. He added: "'The Salty Chicken' was the first story outline that we wrote for series two and it was always Dolly that I wanted. It took me a year to convince her but what an honor to meet her, work with her and have her part of our special show. She's an amazing and lovely lady�and a�'Lily'�fan too!" Coverage is available from Kids Screen here, Variety here, Hidden Remote here and World Screen here. Season two of the program, currently in production, starts on Nick Jr. in the U.K. on June 6 and on Sprout in the U.S. on June 27, although Dolly's guest spot is expected to be broadcast in 2017. The University of Tennessee's Daily Beacon this week offered one writer's recap of a Hallmark Channel taping of Home and Family at Dollywood over the weekend. Read it here and don't forget to watch the shows with Dolly all next week at 10 a.m. Eastern. The Knoxville News Sentinel this week reported on last week's opening of Dolly' new Lumberjack Adventure dinner theatre. Read the story here. The June 4 Billboard charts released Tuesday showed Don Henley's Cass County, featuring the Dolly duet "When I Stop Dreaming," loses seven this week to No. 46 in its 34th chart week on the country albums tally. Word came on Sunday from the venue that Dolly has added a stop in the Bluegrass State on her Pure & Simple Tour: Aug. 9 at Centre College's Norton Center for the Arts in Danville, Ky. A sponsor and subscriber presale starts at 9 a.m. June 1, with public tickets on sale starting June 6 on the venue website. Media reports claim this will be her only Kentucky concert on the tour and her most intimate/smallest venue on the tour as well. Read more from The Courier Journal here and Lexington 18 here. 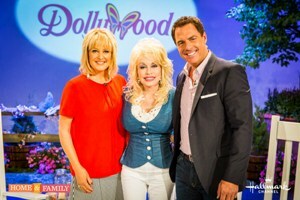 Dolly was at Dollywood on Saturday and Sunday taping episodes of The Hallmark Channel's Home and Family morning program from the park's Celebrity Theatre and even had a special guest in Dolly Parton's Coat Of Many Colors star Alyvia Alyn Lind, according to Knoxville's Local 8 Now News here. As was previously reported here, the five episodes from the park featuring daily Dolly performances will air on the cable network each morning at 10 a.m. Eastern Memorial Day week. Dolly was on hand Friday to cut the ribbon at her new Lumberjack Adventure dinner theatre in Pigeon Forge. The venue live streamed the ceremony on its Facebook page, and the footage is viewable in the media player above. Coverage included Knoxville's WBIR here, Asheville, N.C.'s WLOS here and Greenville, S.C.'s WYFF here. Dolly's official website posted a story here and a clip from the new song Dolly wrote for the show, "Something More," which is also available in the media player below. Dolly's publicist on Friday issued a press release celebrating the good ticket sales for the dates announced thus far on her Pure & Simple Tour, which included a quote from Dolly: "Wow, I'm flattered folks want to check out my big ticket tour! I'm so honored the fans are spending their hard-earned money just to come see our show. It sure means a lot and I can't wait to get out there on the road and see them too." CMT has announced that Dolly and Emmylou Harris will appear on CMT Hot 20 Countdown this weekend to discuss The Complete Trio Collection Deluxe and to celebrate the 40th anniversary of their first public performance as the Trio with Linda Ronstadt on Dolly's syndicated variety show. The episode premieres at 9 a.m. Eastern Saturday with a repeat at 9 a.m. Sunday. Read a story about the appearance here. Don't forget Dolly will have an 11 a.m. ribbon cutting at her new Lumberjack Adventure dinner theatre in Pigeon Forge on Friday that will be carried live on Facebook. In related news, an interview with Dolly from a few weeks ago at Dollywood made Johnson City, Tenn., TV station WJHL here on Thursday. Also, Paste magazine has an audio interview with her here posted Thursday night. An additional date has been added to Dolly's Pure & Simple Tour: July 20 at the Grand Casino Hinckley Amphitheater in Hinckley, Minn. Regular seats, $65-$200, and VIP packages go on sale to the public at 10 a.m. Central time Friday on Ticketmaster. In related news, Rolling Stone reported here in an interview with Dolly on Wednesday that the tour will total 66 cities. Thus far, 47 shows in 46 cities have been revealed, leaving 20 cities yet to be announced. A Texas high school participating in a leadership program named after former Gov. Ann Richards interviewed Dolly recently, and the interview has been posted here. Dolly Parton's Coat Of Many Colors this week earned an interview for producer Sam Haskell in Patheos here and one with Alyvia Alyn Lind on Gold Derby here. Also, the film's planned sequel for this Christmas season was given its official NBC network page this week here. LGBT cable network Logo has revealed 9 To 5 will be shown as part of the third season of the channel's Cocktails and Classics, where guests chat about a classic campy film while watching it. The preview commercial for the new season, which starts June 5, also shows Dolly was interviewed via satellite for the program. Last season featured Olympia Dukakis as a guest when they showed Steel Magnolias. The air date with Dolly has not been revealed. The May 28 Billboard charts released Tuesday showed Don Henley's Cass County, featuring the Dolly duet "When I Stop Dreaming," rises three this week to No. 39 in its 33rd chart week on the country albums tally. Three new dates on Dolly's Pure & Simple Tour were announced on Monday: Aug. 6 at Van Andel Arena in Grand Rapids, Mich., Aug. 12 at the BOK Center in Tulsa, Okla., and Sept. 10 at the Foley Community Centre in Foley, Ont. Ticketmaster will have venue, media, promoter and Ticketmaster presales starting at 10 a.m. local time Thursday for Grand Rapids and Tulsa, with platinum seats and VIP packages also on sale at that time. Public sales start at 10 a.m. Friday for both. Tickets for each run $53 to $123. The new Canadian show was revealed in The Parry Sound here thanks to the township council needing to approve the concert at their meeting, which will be a fundraiser to benefit the West Parry Sound Health Centre and Charles W. Stockey Centre for the Performing Arts. The article says tickets will be available for purchase "soon." Dolly has contributed her Little Engine That Could song "I Believe In You" to a CD sent to every toddler in Scotland by the Scottish Book Trust, Bookbug Toddler CD. Read more about it here, watch a video in the media player above and listen to the track below. Friday's ribbon cutting at Dolly's Lumberjack Adventure will take place at 11 a.m., according to the ceremony's Facebook event posted Monday here. The Hallmark Channel has released a teaser video, watchable here or in the media player below, promoting the week of Home And Family episodes from Dollywood, which it has previously been reported here will begin airing the week of May 30. SiriusXM on Friday aired its Radio Andy Town Hall interview with Dolly, posting a couple of clips to YouTube of the "Dolly Wood or Dolly Woodn't" segment here and Dolly talking about Whitney Houston's cover of "I Will Always Love You" here. In addition, they released a video here and in the media player above of host Andy Cohen shopping for items at the park. ABC News covered the interview here. Finally, several galleries from the taping have been added to that section of the site here. NBC on Sunday released some details for the new season at the annual "up fronts" including releasing the artwork at left for the upcoming Dolly Parton's Christmas of Many Colors: Circle Of Love, this winter's sequel to Dolly Parton's Coat Of Many Colors which will focus on the year the children gave up their gifts so their father could give their mother a wedding ring. An unexpected blizzard threatens the family, and a relative recognizes Dolly's talent is bigger than the Smokies. The special should air this year's Christmas season. Dolly may be coming to the Smoothie King Center in New Orleans on Nov. 30 as part of her Pure & Simple World Tour. On Friday morning, Ticketmaster, her official Facebook page, her official website, Live Nation and the venue's official Facebook page all announced the show, but by afternoon each one had removed the announcement and promoters were not responding to requests for information. The original information had VIP sales starting Wednesday, presales starting Thursday and public tickets, $42-$82, beginning 10 a.m. Friday. Check out coverage from The Times Picayune here, NOLA Defender here and Best Of New Orleans here. Dolly's Lumberjack Adventure announced Friday that Dolly will be on the new dinner theatre's grounds next Friday, May 20, for a ribbon cutting ceremony which will be carried live on the venue's Facebook page. The restaurant opens to the public the next day on Saturday, May 21. In a press release, show Executive Producer Dolly, who wrote the new song "Something More" for the production, said: "I can promise you've never seen another show like this in town before. I've truly enjoyed creating this Smoky Mountain story for families to enjoy while they are here in Pigeon Forge. There are completely new experiences for guests at this show and I can't wait to hear what they think of the finished product." Learn more here. Apparently following through on her suggestion that husband Carl Dean may consent to an interview on the occasion of their 50th anniversary, her official Facebook page posted their wedding photo Friday with the message: "After 50 years of silence my loving husband, Carl, is going to tell it all. What do you want to know about Carl & me? Ask anything!�#DollyAndCarl" Check it out here. The Atlanta Journal-Constitution reports that Dolly Parton's Christmas of Many Colors: Circle of Love will film in the metro Atlanta area, just like Dolly Parton's Coat Of Many Colors, and shared casting notices for some roles in the sequel here. CBS on Sunday will salute journalist Morley Safer, who is retiring, with a one-hour special Morley Safer: A Reporter's Life featuring his career-best interviews including Katherine Hepburn, Jackie Gleason, Meryl Streep, Helen Mirren and Dolly. He has said in interviews he was disappointed to get assigned the 60 Minutes interview with Dolly to promote 9 To 5: The Musical, thinking it would be a fluff celebrity piece but he was so impressed with her that he named it one of his all-time favorite interviews of his career. Dolly's The Tour Collection falls back off the top 20 British country compilation albums again this week, down from No. 16, Friday's charts revealed, while Emmylou Harris' Original Album Series, Volume 1 (with two Dolly covers, one track with Dolly harmony and one track with Trio harmony by Dolly and Linda Ronstadt) gains six to No. 11. Don't forget to tune in to Radio Andy, channel 102 on SiriusXM satellite radio, for the Town Hall Series interview Andy Cohen conducted last Friday with Dolly at Dollywood. The comprehensive, in-depth interview covers 90 minutes and premieres at 4 p.m. Eastern Friday with repeats at 7 p.m. Friday, noon and 6 p.m. Saturday, 6 a.m. and 10 a.m. Sunday and 6 a.m., 10 a.m. and 1 p.m. Monday. Look for photos from the interview to be posted here over the next few days. Live Nation has announced the one Dolly concert that will be part of the "$20 Kick Off To Summer Sale": her June 18 date at Darling's Waterfront Pavilion in Bangor, Maine. The cheap tickets will be available starting 10 a.m. Friday and conclude when sold out or 11:59 Pacific time May 20, whichever comes first. Although Linda Ronstadt cannot sing any longer, making new recordings by The Trio impossible, Dolly says that doesn't mean they won't work together in the future. She'd like for Ronstadt to produce a new album of duets by Dolly and Emmylou Harris, according to Contact Music here. The ladies see their complete recordings boxed set The Complete Trio Collection Deluxe come out Sept. 9. A video has emerged of Dolly meeting a young man with some kind of disability this past weekend when she was in Pigeon Forge. Watch the sweet footage here. NBC Entertainment President Robert Greenblatt told Ad Week this week that he has no regrets about his appearance with Dolly at last year's "Up Fronts" with advertisers where he played piano for a performance with Dolly to promote her series of films for the network, saying since her first film was so successful that it doesn't matter what people think. Read more here. Dollywood's Splash Country water park opens Saturday for its 16th season with upgrades to the turnstiles, retreats and canopies, food locations and family locker pace. In a press release, General Manager Mike Brown noted: "We always want to treat our guests to a few surprises each season. This year, we hope they notice more efficiency, more amenities and great new food options. Our team is ready for the 2016 season!" Parade spoke again this week with Dolly's sister Stella about their family and relationship. Check it out here. Although it was previously reported here that actor Ricky Schroder a month ago spilled the beans that the entire cast of Dolly Parton's Coat Of Many Colors had agreed to return for a Christmas sequel to film this July and air this holiday season, the official announcement of the project came on Wednesday. Dolly Parton's Christmas of Many Colors: Circle of Love will tell Dolly's favorite holiday story from her childhood: when the children agreed to forgo any Christmas presents so their father could finally buy their mother a wedding ring, then turning the ring into a contest to find where he had hidden it: on a bubble light on the first Christmas tree they had after getting electricity. The press release notes the film will also showcase the family being threatened by an unexpected blizzard and a relative (presumably Dolly's Uncle Bill Owens) recognizing that her musical gifts could take her out of the mountains and into stardom. The original cast will return, as will the original director, writer and executive producers. "I was so overwhelmed and touched by how many people watched 'Coat of Many Colors' and their reaction to it," Dolly said. "The song 'Coat of Many Colors,' of course, has always been my favorite and has touched so many people through the years, especially me. It is a true story from a very special time in my childhood. I am so happy to share this story with the viewers and to say there is so much more to tell because mine truly has been a life of many colors. I hope the viewers will fall in love all over again." NBC Entertainment Chairman Robert Greenblatt explained: "It's no secret that everyone loves Dolly Parton and the response to our first movie was overwhelming, both in terms of the size of the audience and outpouring of love for a film with family values and faith. So it felt like a no-brainer to bring this talented cast back together and tell another compelling holiday story culled from Dolly's own life growing up in the Smoky Mountains of Tennessee. Her spirit and belief in God � and her music � will infuse this movie with the true spirit of Dolly Parton." In related news, Schroder spoke with Golden Derby about the casting process for the first film here. An additional Canadian date on Dolly's Pure & Simple Tour was announced on Wednesday: Aug. 4 at the Colosseum at Caesar's in Windsor, Ont. Presales and VIP packages begin at 9 a.m. Eastern next Wednesday at Ticketmaster with general public sales starting at noon May 22. In addition, VIP packages have been added to her Aug. 2 Columbus, Ohio, date and will go on sale the same time as general public tickets at noon Saturday via Ticketmaster. Dolly fans on Facebook Wednesday were sharing a set of images Sound Biscuit Productions posted of Dolly in their studios last Friday recording lines for an animated character "Noleen" in the episode "Salty's Got Talent" of the show Lily's Driftwood Bay. Check them out here. The Northern Ireland show airs in the U.S. on Nick Jr.
Knoxville television station WATE reported a small fire in the attic of the host area of Dollywood's Slidewinder ride was quickly put out on Tuesday afternoon. Read the story here. Two more Pure & Simple Tour dates were added to Dolly's itinerary on Tuesday: a second consecutive night at the Hollywood Bowl on Oct. 2 and a Sept. 27 San Diego-area date at the Valley View Casino in Valley Center, Calif. In addition, the Boston concert which Dollymania.net on Monday night was the first media outlet to uncover or report was officially announced on Tuesday, complete with information that seats will be sold via Ticketmaster on Citi Cardmember presale starting 10 a.m. Eastern Wednesday, "Local presales" and VIP tickets starting 10 a.m. Thursday and public sales beginning 10 a.m. Friday (public sales will be both via Ticketmaster and the venue box office here). The second Hollywood Bowl show goes on Ticketmaster's American Express presale, "fan presale" and VIP at 10 a.m. Pacific time Wednesday, Ticketmaster presale at 10 a.m. Thursday and public sale at 10 a.m. Saturday. The Ft. Wayne show on Tuesday added information about VIP packages beginning on Ticketmaster at 10 a.m. Wednesday and Ticketmaster and venue presales at 10 a.m. Thursday before the previously-reported public sales on Friday morning. Seats for the San Diego area show will be sold via AXS.com and go on sale at 10 a.m. Pacific time Friday. Also, Billboard reported Tuesday that Dolly is among the more than 150 artists participating in Live Nation's annual "Kickoff To Summer" promotion for limited $20 seats at Live Nation's system of amphitheatres. While Dolly's specific shows participating have not been announced, the article noted that the number of cheap seats will vary from venue to venue and concert to concert but some will have as many as 1,000 offered, with the vast majority being general admission lawn seats at the back of the amphitheatres. The $20 ticket sale dates will also vary from concert to concert but the first ones will begin to be offered on Friday. Read more here. The first galleries from Dolly's Friday appearances have been added to a new section of the website here. More to come! Lily Tomlin says Grace and Frankie, which just released its second season, has started filming but she tells AOL that right now "there's no sign of Dolly in the vista." She adds: "Jane and I are ever hopeful. We love Dolly. We want her to be on the show." Read her interview here. The May 21 Billboard charts released Tuesday showed Don Henley's Cass County, featuring the Dolly duet "When I Stop Dreaming," rises four this week to No. 42 in its 32nd chart week on the country albums tally. As has become pretty routine most Mondays for the past month and a half, several additional dates from Dolly's Pure & Simple Tour were released by venues. The six new shows bring the total scheduled thus far to 39 out of the 60 or more dates expected to be planned. The final date on the first leg of the tour was revealed: June 21 at Boston's Wang Theatre in the Citi Performing Arts Center. No word on when tickets, which will be sold via Ticketfly.com, will be available. The other dates are on the later legs of the tour: July 19 at the U.S. Cellular Center in Cedar Rapids, Iowa; July 22 at the Denny Sanford PREMIER Center in Sioux Falls, S.D. ; July 29 at Sprint Center in Kansas City, Mo. ; Aug. 3 at Memorial Coliseum in Fort Wayne, Ind. ; and Sept. 24 at the Shoreline Amphitheatre in Mountain View, Calif. Ticketmaster will offer fan and VIP presales at 10 a.m. Central Wednesday for Cedar Rapids with radio/venue/Ticketmaster presales at 10 a.m. Thursday and public sales starting at 10 a.m. Friday; public sales of Fort Wayne at 10 a.m. Eastern Friday; and venue/Ticketmaster presales and VIP packages for the Sioux Falls show at 10 a.m. Central Thursday with the public sale at 10 a.m. Friday. Live Nation will start selling the Kansas City seats to the public starting at 11 a.m. Central Friday and the Mountain View radio and Live Nation presales at 10 a.m. Pacific Thursday with the public sale at 10 a.m. Saturday. The 700 Club on Friday broadcast its interview with Dolly about her life, career and the Dolly Parton's Coat Of Many Colors DVD. Watch it on YouTube here or in the media player below. Dolly on Friday sat down with Bravo host Andy Cohen for a 75-minute interview to air on his Radio Andy channel on SiriusXM Radio for a candid, wide-ranging, in-depth conversation before an intimate crowd of 15 SiriusXM subscribers who won a contest to submit questions for Dolly, their 15 guests, a small consort of media and a couple dozen Dollywood staff in the Dreamsong Theatre at the park. 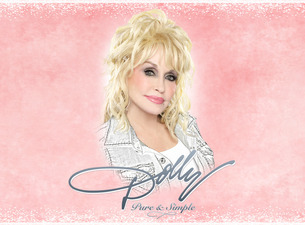 In his introduction, Cohen announced that her new album, Pure & Simple With Dolly's Biggest Hits, will be released Aug. 26. They chatted about the album, the upcoming tour (he asked if she was planning to sing "Baby I'm Burning," which she said she wasn't planning to perform, but after he called it her "gayest song," she responded "Well, if it's for my gay boys I've gotta do it! "), her husband (noting that he might even consent to his first-ever interview in honor of their 50th anniversary later this month), whether she'd consider doing a reality show (she is thinking of doing a "Searching For Dollys" show for the casting calls for the Broadway musical based on her life), how big of a fan she was of Prince (and how she got to know Michael Jackson when she was Sandy Gallin's co-host for his big celebrity parties a couple of times a year when he was her manager) and more. He played a word association game with names of fellow artists and a "Dollywood" or "Dolly Wouldn't" game (which featured humorous responses of whether there was a third sign to answer the question of if she would record a duet with Kanye West and an answer of "Dolly wouldn't say" as to whether she'd smoke a joint with Willie Nelson). A handful of the contest winners asked their questions, including her most embarrassing stage moment. The full interview is currently slated to air on Radio Andy at 4 p.m. Friday with later repeats. The day ended with her annual Homecoming parade through Pigeon Forge (video below from her official Facebook page's live streaming feed the day of the parade) on a float to promote her new Lumberjack Adventure dinner theatre, which opens in less than two weeks. Then on Saturday her schedule must have changed because she managed to get in a surprise late afternoon park tour although park officials had said days before that she wouldn't be able to make any in-park public appearances over the weekend. Coverage of the interview made The Knoxville News-Sentinel here, WATE here, The Mountain Press here and Dolly's official website here (which also covered the parade here). Fans enjoyed the unofficial fan dinner Friday night and Night Of 1,000 Dollys at Club XYZ Saturday night. Also that weekend, the park's DreamMore Resort hosted its first wedding since opening nine months ago. The happy couple, Jason Denton and Kenneth Corbin, report that the event was magical and everything handled perfectly by the resort (Dolly even congratulated them on the wedding the next day). More photos to come! 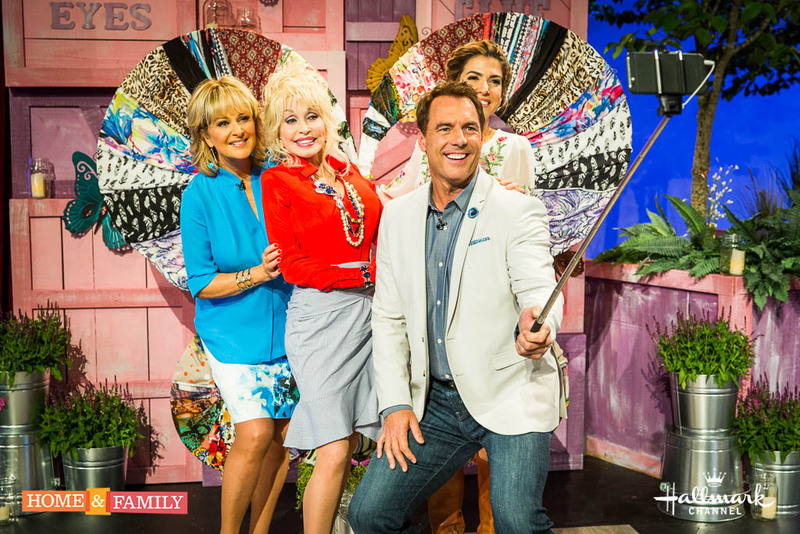 Photos are copyright � 2016 T. Duane Gordon/Dollymania.net. All rights reserved. May not be reproduced or used without prior written consent. Click on the tumbnails for a larger view. This Morning on CBS spoke with Dolly in an interview that aired on Thursday. Check it out here. And PBS' New York-area newsprogram Metro Focus chatted with her last week. That video is available here. Dolly's The Tour Collection re-enters the top 20 British country compilation albums again this week at No. 16, Friday's charts revealed, while Emmylou Harris' Original Album Series, Volume 1 (with two Dolly covers, one track with Dolly harmony and one track with Trio harmony by Dolly and Linda Ronstadt) dips one to No. 17 and her Original Album Series, Vol. 2 (featuring one track with Dolly harmony and two tracks with Trio harmony) falls out of the top 20, down from No. 17 on the same chart. Crave Online profiled the top nine works at the Frieze New York exhibit that concluded on Sunday, including two of Andy Warhol's Dolly prints among the nine best pieces shown over the weekend. Check out the story here. The children's book version of Dolly's classic song Coat Of Many Colors is getting a second life. A new hardcover and e-book edition with a new illustrator, Brooke Boynton Hughes, is slated to come out Oct. 18. Because the book is being published by Penguin imprint Grosset & Dunlap, and Penguin is Dolly's publishing partner for her Imagination Library literacy program, I expect the title will soon be added to the Library project. The original Coat book was illustrated by Judith Sutton and published in 1994 by Harper Collins. Reserve your copy of the new version here! Thanks, Chuck! After just one week on the charts, the new Cracker Barrell compilation disc from Dolly and Porter Wagoner, The Right Combination, falls off the 50-position country albums chart this week, down from No. 45, the May 14 Billboard charts released Tuesday revealed. On the same tally, Don Henley's Cass County, featuring the Dolly duet "When I Stop Dreaming," gains one to No. 46 in its 31st chart week. Four explosive-sniffing dogs trained in the U.K. are headed to Dollywood as part of security upgrades to keep guests safe in the current world of terrorists and other threats, Pontefract and Castleford Express reports here. Originally rescue dogs, their names are Harry, Mitch, Chip and Blaze. Fast Cocreate has named a scene featuring Dolly music the year's "most uplifting movie moment." It comes from The Meddler featuring JK Simmons introducing Susan Sarandon to his chickens who love Dolly music, leading him to play "Here You Come Again." Read how the scene came to be here and watch it on that page or the media player below. The first five Canadian dates for Dolly's Pure & Simple Tour were announced on Tuesday: Sept. 9 at the Molson Canadian Amphitheatre in Toronto, Ont., Sept. 13 at the Mosaic Place in Moosejaw, Sask., Sept. 16 at the Scotiabank Saddledome in Calgary, Alb., Sept. 17 at the Rogers Place in Edmonton, Alb., and Sept. 19 at the Rogers Arena in Vancouver, B.C. VIP tickets appear to be on sale now for all of the announced Canadian dates except for Edmonton, while all of them except for Moosejaw are currently on American Express presales as well with additional presales for each city starting on Thursday. General public tickets become available for Toronto on Friday and the other four cities on Saturday. All of them are being handled via Ticketmaster except for seats in Moosejaw, which are being sold via the venue's website here. In related news, the tour has its first official sell-outs with no tickets remaining this week for either her Kent, Wash., show or Cincinnati, Ohio, performance. In advance of Mother's Day this weekend, Dolly as promised released a free download of the track "Mama" from her upcoming Pure & Simple With Dolly's Biggest Hits CD. The MP3 is available from her official website here, which also posted a story written by Dolly's mother about her in 1975 here. Dolly Parton's Coat Of Many Colors came out on DVD Tuesday, and promotional media included an AP video report here, a meeting with newcomer Mickey Guyton that appeared on CBS' This Morning here in advance of a full interview segment with her airing on the program Thursday, Parade here, Rolling Stone here and FOX News here. People magazine is profiling Dolly's upcoming renewal of her wedding vows upon her 50th anniversary with stories here and here. Highlights of the historic nature of Dolly opening Dollywood for its first day 30 years ago Tuesday made television stations WBIR here and WJHL here. Don't forget Dolly will be back in town this weekend for her annual Pigeon Forge parade at 6 p.m. Friday, which it was previously reported here will be live streamed on Dolly's and her new Lumberjack Adventure restaurant's official Facebook pages. And if you're in town to see the parade, you should check out the unofficial Dolly fan dinner Friday night here and Saturday's 10th Night Of 1,000 Dollys party held again this year at Knoxville's XYZ Club. Five more shows were announced Monday for Dolly's Pure & Simple Tour: June 5 at the Peace Center in Greenville, S.C.; July 26 at the UCCU Event Center on the campus of Utah Valley University in Orem, Utah; July 27 at Red Rocks in Morrison, Colo.; Sept. 25 at the Santa Barbara Bowl in Santa Barbara, Calif.; and Sept. 28 at Vina Robles Amphitheatre in Paso Robles, Calif. Seats in South Carolina, $100-$500, go on sale at 10 a.m. Eastern Friday from http://www.peacecenter.org. Tickets for Vina Robles, $75-$199, go on sale via Ticketmaster at 10 a.m. Saturday to the public but have a wine club presale starting Thursday at 10 a.m. Pacific time and internet presale starting at 10 a.m. Friday. Admissions for her Santa Barbara night go on sale at 11 a.m. May 7 while the Red Rocks show, $49-$129, go on VIP sale at 10 a.m. Mountain time Tuesday with regular presale at 10 a.m. Thursday and public sale at 10 a.m. Friday, both through through AXS. Tickets for the Utah concert, $75-$100, will be sold via SmithsTix here starting at 10 a.m. Friday for regular seats and VIP packages. In addition, ticket prices for her Nov. 15 Pigeon Forge engagement have been announced: $25, $50 and $75. As was previously reported here, Dollywood season passholders get presale tickets starting June 15 before the on sale date to the general public on July 1. Dolly Parton's Coat Of Many Colors hits store shelves on Tuesday with a bonus featurette, alternate version of the film and deleted scenes, prompting Taste Of Country to share an exclusive deleted scene here and AOL's The Boot here. In addition, the film's producer was profiled in the North Mississippi Daily Journal here. Finally, Dolly's Yahoo TV interview to promote the release was posted online Monday here. The Hallmark Channel has announced that Home And Family the week of May 30 will feature daily shows from Dollywood with a different "live performance" from Dolly herself every day that week. Check out their promo video here. The Essential Dolly Parton earned another week on the top 40 Australian country albums chart over the weekend, inching up one to No. 35 in its 89th chart week Down Under. Stephen Miller's Dolly biography Smart Blonde gets an update and a re-issue by The Overlook Press on June 7, it has been announced. Reserve your copy here!